Without protection, the rear area of a truck cab can take a beating from regular use—especially when the truck is used for transporting ATV’s, lawnmowers, materials and other equipment. Great Day’s Rugged eliminates the scratches, “dings” and broken rear windows that are not only costly to repair, but tremendously reduce a truck’s resale value. The Rugged Rack is constructed of rust-proof, super-tough, 1 ½” aircraft aluminum and comes standard with a rock-solid black powder-coat finish. Its design features a strategically positioned framework that provides total protection from shifting loads. 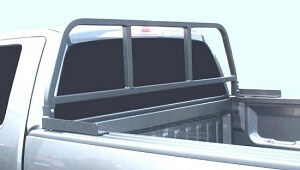 The Rugged Rack fits all trucks with inside bed widths from 62 to 65 inches. The heavy-duty mounting plates come complete with installation instructions and necessary attachment hardware. The Rugged Rack is backed by a two year warranty. The Rugged Rack weighs only 19 lbs. and is UPS shippable. THIS ITEM IS ONLY INTENDED FOR FULL SIZE TRUCKS. IT WILL NOT FIT ANY SMALL OR MID SIZE TRUCK.